Gloria teaches Pilates, and has a wide variety of workout tops. Upbra® bras are designed to keep you in place and totally comfortable. They are the first cleavage bras that you can wear as activewear! Perfect for activities like Pilates, Yoga or just "working out" at the gym. See her video now. Upbra® bras help active women look incredible! Karisa walked in with a bag full of pretty bras that she liked because of their looks. She walked out with an Upbra® bra because of how it made HER look! Choose Upbra® bras to close the "Implant Gap"
Alissa, who is a 34D, recently had implants, which are often spaced farther from each other. Alissa was so happy with the look she got from her new Upbra® bra! She came back later with a new dress that looked amazing. In her pictures, she is wearing her Upbra® in the "medium" lift setting. See her video now. Samantha could not find any strapless bra that stayed up and filled out and gave her a knockout look in her formal dress, so to be fair, we compared an Upbra® bra in the 'down' position to an Upbra® bra in the 'UP' position. See her talk about her experience in her video interview. Katie told us that she has never been able to find any bra that would lift her and give her cleavage at the same time. After we showed her how to set Upbra® in the UP position, she was thrilled with her new look. Sahara was having a hard time finding a 32C bra that would live up to all the promises out there. So we gave her a 32C Upbra® bra. Even though she'll be able to adjust her new Upbra® bra from "low lift" to "medium" and all the way to "amazing lift" we're pretty sure Sahara is going to stick with "amazing lift". Lift for larger cup sizes! If you're a 34D or 36D and have wondered how to get a better look from your bra, check out the results Desarae got when she tried a 34D Upbra® bra. She told us she had given up trying to get great results from any bra!! 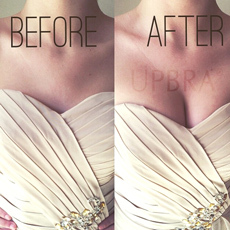 Upbra® bras work great as strapless bras. 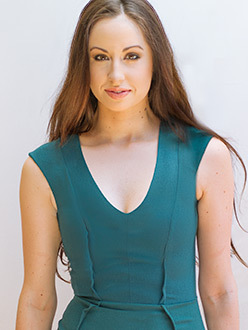 Alexis came in with her own major brand 34A strapless and compared it to a 34A Upbra® bra. Upbra® bras are perfect for smaller cup sizes! Arianna wears a 34B bra and came in with some of her bras and blouses. We had her try an Upbra® bra and she was amazed. She looked really incredible in her new Upbra® bra. 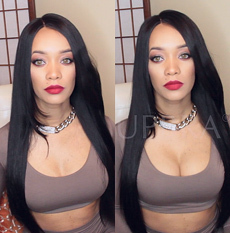 In these two pictures, she's wearing an Upbra® bra size 34B set to med/high lift. Sometimes an Upbra® bra IS PERFECT for work! Victoria works at Hooters and now she plans to always wear her new Upbra® bra at work. At left, Missy compares the extreme-padded major brand bra to an Upbra® bra. Upbra® bras let you control your lift and cleavage, and the best part is that the results are all you!